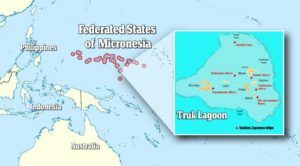 Situated in Micronesia, the islands of Truk circle the worlds largest lagoon – some 822 sq miles. It offers endless excitement and pleasure for the diving enthusiast. In the stunning and tranquil waters of Truk lie around 60 war ships from the Japanese Imperial Fleet. They were sunk on February 16 1944, during WWII. This is recognised as one of the best dive locations in the world. Many original items on board are still clearly visible. It is a virtual underwater museum and has been legally declared a war monument. Truk is arguably the ultimate in wreck diving, while offering diving of all kinds; with walls, drop offs and pristine reefs. A YouTube video prepared during WW II showing footage from the attacking aircraft. 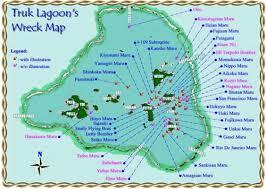 Blue Lagoon Resort – Highly recommended.